Dave Marley was not about to let a brain aneurysm scuttle his hockey dreams. Thanks to the love and support of family and friends, the 46-year-old North Carolina adult player is back in the game. For most hockey players, stepping on the ice before a game is routine. For Dave Marley it’s a miracle. After brain surgery, a long convalescence and intense physical therapy, Marley finally made it back to hockey. In September he played a game with his old C-league team as his family watched. He even scored a goal. Returning to hockey was on Marley’s mind almost as soon as he regained consciousness. He awoke in the emergency room to find his clothes had been cut off. Marley asked his daughter if they had cut his hockey gear as well. “It never dawned on him he might not play again,” Elizabeth recalls. After the dire prognosis from one doctor, a surgeon performed a “coil procedure” in his brain to repair the aneurysm and stop bleeding in his brain. The next day doctors drilled into his skull to insert a drain to remove fluid from the brain. Marley woke up to find he was paralyzed on the left side of his body as the result of a stroke during surgery. Through all this, getting back on the ice remained in the back of his mind. Marley asked his wife for his iPhone. 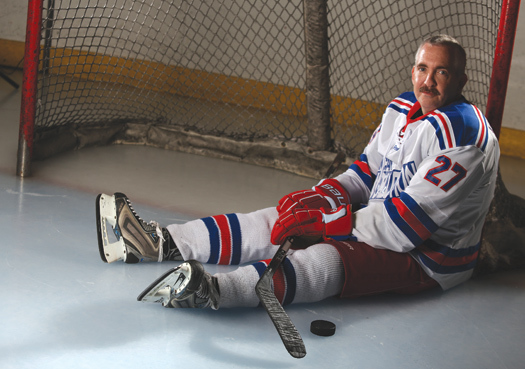 “Soon as I got the phone in my hand I started looking for hockey and aneurysm,” he says. The results of his search weren’t encouraging. However, just days after he collapsed, Marley received a phone call from someone who had survived a similar trauma. Vice-President Joe Biden was treated for two aneurysms in 1988 and learned about Marley’s condition through a family friend who contacted U.S. Rep. Larry Kissell. At Kissell’s urging, Biden phoned Marley in the hospital. “It was an encouraging call. He said, ‘It’s not the end of the world.’ At that point I was laying in bed with a drain stuck in the top of my head,” Marley says. Dave Marley’s recovery from a brain aneurysm has meant that both he and his son Logan have returned to the ice, and the game they love. A few days later Marley began to have movement on his left side. During the ensuing physical therapy he tried doing a skating crossover with his walker. Discharged from the hospital 15 days after his collapse, Marley spent the next two months going through physical and occupational therapy twice a day. As soon as he could, he picked up his hockey stick and fired shots in his driveway. “He knew he was going back,” Elizabeth says. His therapy ended in August, by which time he had regained the use of his left side save for lingering difficulty with fine motor skills in his left hand. Then, seven weeks after his collapse, Marley skated with Logan for about 20 minutes. He says the first time back on skates felt strange, and he had to think about every move. Three weeks later he got back on the ice for a stick-and-puck session. Still he continued to improve with each session. Finally, in early September, he rejoined his C-league team at the Greensboro (N.C.) Ice House. Not only did he play in each game, but he scored three goals over the course of his first four games. Hockey was not only motivation for Marley to recover from the effects of the aneurysm, but the sport has also promoted healing in the family itself. Marley’s collapse was shocking for Logan, who didn’t play hockey while his dad recovered. 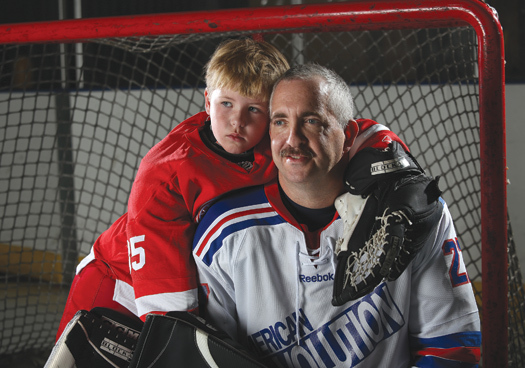 Now, both father and son make the 30-minute drive from home to the rink several times a week. Hockey also meant a return to normalcy for the Marley family. Before his collapse, Marley routinely left his sweaty gear on the floor near the washing machine for Elizabeth to toss in with the laundry. When that habit resumed, Elizabeth took a picture of the gear and the washer and posted it on Facebook. Marley feels almost back to his pre-aneurysm self. He says he has more than 90 percent mobility on his left side, and he is regaining energy after weeks of constant fatigue. Michael Huie is a freelance writer based out of Winston-Salem, N.C.